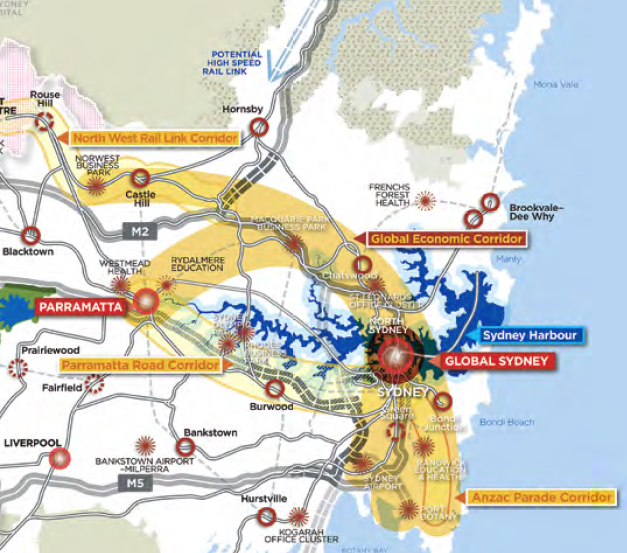 In Sydney Commute Times Mapped Part 1 I took a small step to a bigger goal of mashing together public transport in Sydney, and the Metropolitan Strategy for Sydney to 2031. The question I wanted to answer is this: how aligned is Sydney's public transport infrastructure and the Metropolitan Strategy's of a "city of cities"? Thanks to the release of GTFS data by 131500 it is possible to visualise how long it takes via public transport to commute to the nearest "centre". The Australian Bureau of Statistics collects data based on "mesh blocks", or roughly an area containing roughly 50 dwellings. Last week I had some fun mapping the mesh blocks, as well as looking at Sydney's urban densities. These mesh blocks are a good size to look at for calculating commute times. The first map I created was simply to indicate how long it would take to the nearest centre. There appears to be rapidly poorer accessibility on the fringe of Sydney. I was also surprised of what appears to be a belt of higher times between Wetherill Park and all the way to Marrickville. There also appears to be poorer accessibility in parts of Western Sydney. It is worth noting that I offer not guarantee of the integrity of the data in these maps, and I have seen a few spots where the commute times increase significantly in adjacent mesh blocks. This tells me the street data (from OpenStreetMap) might not be connected correctly. My next map shows what areas are within 30 minutes. I have been interested in mapping traffic for a number of years, maybe ever since arriving in Sydney. It is sort of a hobby; I find making maps relaxing. My first little map was way back in 2008, where I visualised speed from a GPS unit. A little later I added some colour to the visualisations, and then used this as an excuse to create a little GUI for driving speed. My interest in visualising individual vehicles has decreased recently, as it has now shifted to the mapping wider systems. Have an idea you would like to see mapped? Leave a note in the comments.